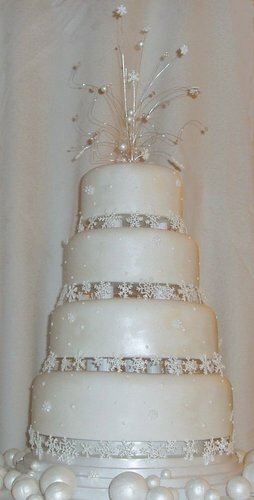 An spectacular 4 tiered wedding cake of snow and ice. Each shimmering tier floats on twinkling sugar snowflakes. Crowning the cake are wired crystals, pearl beads, snowballs and sugar snowflakes. The cake is displayed surrounded by snowballs and scattered snowflakes.